Both William Wills and Bessie Coleman died within minutes of each other as the tragic results of an aircraft accident on April 30, 1926. 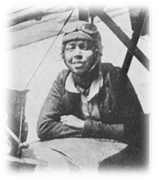 Although little is known about William Wills, his contributions to aviation will be forever bound with the legacy of Bessie Coleman. Bessie Coleman and William Wills looked into the Great Beyond together when her airplane suddenly took a nose dive and then turned upside down at a height of 3,000 feet in Jacksonville two weeks ago. William Wills was a white man, an American citizen and a native of Texas. Miss Coleman was a member of the race generally despised by the race to which Wills belonged. But she was also an American citizen and a native of Texas. Both were engaged in a dangerous profession-they were pioneers in the field and knew that each flight might be their last. Wills knew that one day his plane might do just what it did on that tragic morning; he knew that one day he might be hurled through mighty emptiness to the most horrible death of which man can conceive. He knew the history of Bessie’s race and the traditions of his people, but he did not hesitate in making the flight. In making his decision he was prompted by the skill and efficiency of the aviatrix, not her color. And so he and Bessie died together- a southern black girl and a southern white man on southern soil-both American citizens. What more glorious way is there to die? How better can we prove our loyalty to the country that gives us our sustenance than by dying in the cause of one of its industries? How better can members of two American races die than side by side in a common cause? Patriotism, loyalty, know no color, creed nor birth. A country that is good enough to die for, and that applies to all races alike. And if we must die in one of its peace-time occupations as well as in its struggles to protect our flag and homes, why cannot we die together as Americans and not as black and white races? When the Shenandoah buckled far above the state of Ohio and hurtled down to earth crushing out the lives of a score of Americans, why couldn’t we, as loyal Americans, have been represented among those who gave their all? Why couldn’t there have been some black faces among those who went down in the submarine off the cost of New England, never to rise again? Why, oh, why are we forbidden the chance to play the whole role as American citizens? Why are the doors of West Point and Annapolis closed in our faces? Why have we no students in the United States aeronautical schools? Can it be said that we have not tried every method to prove out loyalty to this country? Have we ever produced to a traitor? Have we shown cowardice where bravery was required? Have we not rushed to the fore wherever the opportunity has been granted us? Being an American citizen is a rare privilege which carries with it certain duties. These duties are to vote, to help maintain this government and to be prepared to defend our flag in the time of trouble. They are not honors to be conferred upon a chosen few, but duties that should fall equally upon the shoulders of all citizens. It is our duty to go to the polls in Mississippi, as well as in Massachusetts. It is our duty to stand prepared to meet the emergencies that may face this nation as much as it is the duty of any other citizen. That Bessie Coleman and William Wills could face death together and that they did meet death together should serve to strengthen the bonds between all Americans. The aviatrix, the only one of our Race, had often been heard to say that she hoped to die in a manner that would react to the benefit of her race and her country. Wills evidently felt the same way, for he was under no obligation to operate a plane with Miss Coleman. Being white he could have chosen to join the world flyers or the United States air squadron, or a million other fields of endeavor, instead of which he chose to fly a plan with an aviatrix distinguished by her color. Both met death as the final stage in their venture- and both died as Americans should die. And in dying together they reached the ultimate aim of real patriotic citizenship.